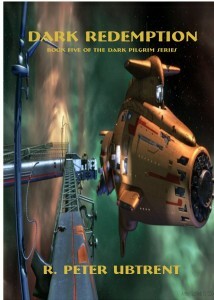 Dark Redemption by R Peter Ubtrent is the fifth book in the stunning Dark Pilgrim series. And still the author keeps up mesmerised and surprised as events in the galaxy continue to twist and turn in directions we could never have foreseen. The universe seems to be crumbling into chaos. The F’gat Ynos are slowly but surely destroying every planet they come across, intent on wiping out the human race. There is general chaos as the hyper gates normally allowing galactic travel are closed as a defencive measure. Only a few vessels are able to create their own pirate gate to travel through. Ailanthus, the Emperor, is still trying to unite the Imperium, the Noble Houses within which are being challenged by The Restoration, whose members are growing more and more desperate. Someone else is after the Imperial throne too. The Dei Glorium, Ailanthus’ intended spouse, has vengeance up her sleeve and possesses an illegal and devastating weapon, but her plan misfires. And Anolis, working with two bounty hunters and a Kroor, still wants to repay his brother’s death, brought about by Ailanthus’ actions in the past. The action doesn’t stop. In contrast to the enormity of the crisis facing the galaxy, emotions on a personal level play an important part in this novel. Love and loyalty emerge strongly, although there is also deception, hatred and dishonesty. The characters, many of whom are now very familiar to us this far along in the series, continue to develop. Each is as complex as the universe they inhabit. Ubtrent has created yet another absorbing novel that it’s impossible to put down.